A showcase of local female artists with bold and powerful contemporary performances was a perfect way to celebrate and honour the role of women in our community. Across time and space, women have played a remarkable role in keeping history alive. 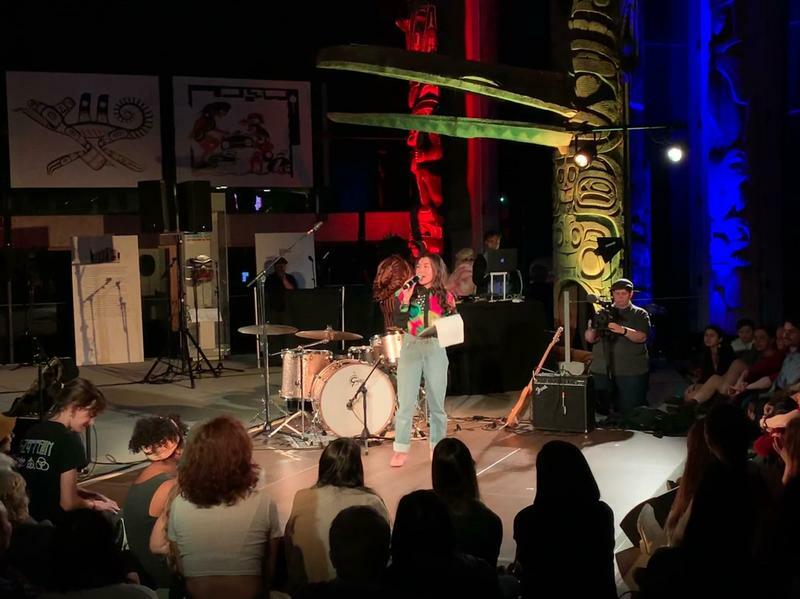 At the Great Hall in MOA, the organizers and the MC, Char Loro, kickstarted the lively night by calling the audience’s attention to the theme of honouring and celebrating female power. The night began with musical trio Fines Triddum and their experimental jazz, which was a delightful impromptu improvisation combined with participation from the audience. Intricate musical patterns of the electric organ and electric guitar intertwined with sporadic drum beats in the background. The amazing unspoken connection among the artists helped them create a diverse range of sensations through music, alternating between being soothing and roaring like a tsunami, which brought utmost auditory satisfaction to the eager crowd. This was followed by a unique street-dance performance featuring four dancers: Kosi, Momo, Leah McFly and Marisa Gold. The audience was stunned with their fascinating combination of hip-hop, breaking, waacking and spoken poetry. The performers came together to represent their different origins and personalities while sharing the message of “bringing love” and “connecting people to the earth,” according to Momo. The atmosphere turned fiery as female rappers of colour raised their voices and challenged issues of colonialism, genocide and discrimination against Indigenous people. Their powerful lyrics induced the audience to chant along in harmony as a reminder of our co-existence and our roles in reconciliation. Rapper Missy D viewed arts as a space of “sisterhood,” an “invitation to [her] world” and a canvas for women to “express ourselves.” She strongly believes in the power of music to convey the significance of Indigenous histories, and the need for the public to acknowledge and educate ourselves about both histories and peoples. Old Soul Rebels ended the concert in high notes with their vigorous and upbeat rock n’ roll that pumped the audience’s late-night energy up. We chanted, we howled, we sang along, we nodded our heads in synchronization and we let our bodies loose to celebrate our presence and each other’s company. The sharing of human energy was so evident and surreal, almost as if it were tangible in the air, glowing and surrounding us with warmth. The audience’s standing ovation at the end was undeniable proof of the effortless connection between the watchers and the performers. Inspiring music of inspiration and an emphasis on personal expression allowed us to fully represent ourselves as women and allies of women.